Die match of Liliuokalani IKI (in gold) and counterstamp on 1982 Kala Dala. Many Hawaiiana collectors get confused with the 13 mm gold Liliuokalani issues (even M&R with their indicated mintage of 2000 for 2MB-171). This picture is of the first Liliuokalani IKI. The counterstamp identifies it. The Kalakaua crest confirms it (crest as seen on the 1883 Kalakaua coinage). The 1982 Liliuokalani 13mm gold further confirms it. The 1982 IKI has a “Hawaiian crest” (see page 136 of M&R of image 2MB-150…design used in 1982 ). RHM publicly available mintage information should read “Hawaiian Island crest”. A few anodized pieces (Royal Hawaiian Dollar (red package), Lucky Menehune Money (green package), and Princess Kaiulani Dollar (pink package) Have been appearing on ebay. The RHM references is not to RHM with mintmaster Bernard von NotHaus. Bernard von NotHaus retired from operating the Royal Hawaiian Mint in 1998. Few products were produced under the RHM banner. Several RHM products are known to be struck in 2004 with the the Bernard von NotHaus designs (owned by BVN) are identified with his personal hallmark which is RHM followed by triangle with a circle and a letter b inside. These products use the original obverse die (with original dates). Uses the Bernard von NotHaus designs (owned by BVN) are identified with his personal hallmark which is RHM followed by triangle with a circle and a letter b inside. Designs created by Pacific Mills carries the RHM hallmark and are dated 2007 and later). As noted by the 1986 date, the RHM (under BVN) did not mint anything in the 1970’s with the RHM hallmark (buyer beware). M&R performed a disservice by not listing this medal. 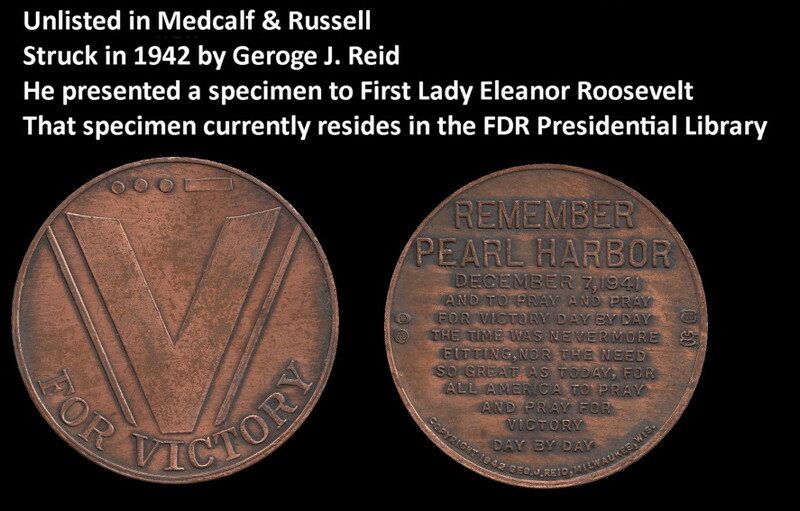 In 1942, George J. Reid (medal designer/minter) presented a specimen to First Lady Eleanor Roosevelt. It currently resides as a permanent part of the FDR Presidential Library and Museum. This just acquired specimen for my collection that out grades the FDR specimen. Bid before its late! I received their hard copy catalog (mostly sport memorabilia) a few weeks ago…. Just a note about my recent acquisition of the 1991 Kaiulani “Mahalo Mintliner Award” medal. I was rather surprised that many of the RHM collectors stayed away and did not bid on this medal. First, it was not listed in the RHM publicly available information and may have been the primary reason for the low bidding activity. Second, “mahalo” is thank you in the Hawaiian language. The medal is thanking someone. Third, the term “mintliner” makes no sense and may have kept away bidders. However, you can derive a meaning if you think “headliner”. As a “mintliner”, one can see it as getting your mint recognized among all mints or peers in the minting business. Fourth, the term “award” means the medal is being awarded to someone. Fifth, the full name of the RHM mint master, Bernard Von NotHaus, is on the medal. The medal is being awarded to him or with his approval to a recipient (most likely employees of RHM). In either case, the mintage would be small and not sold to the general public. Lastly, I know the reverse design. It was used previously on a larger coin. If collectors recognized it, bidding activity may have been stronger. See the images (note the decorative design in the center top and bottom).